For the last three years, we have escaped the Dubai heat and travelled to southern France. Languedoc, Dordogne, Cote d'Azur, Var, Vaucluse - we've seen them all. 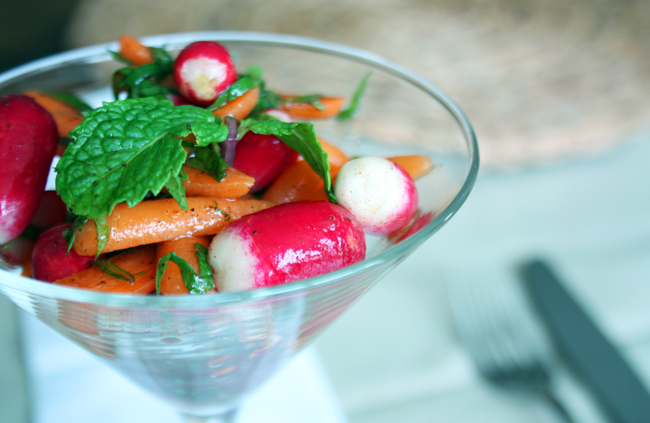 And there's one thing that binds them - something I can't seem to get anywhere else in the world.... Radishes. Not just any kind of radishes - the tiny sweet, peppery rosebud type aptly named "French Breakfast" radishes. I don't eat them for breakfast, but they do taste amazing with a baguette, a slab of butter and Camargue sea-salt flakes, with a chaser of Picpoul or Provincial Rosé. The problem with French Breakfast radishes is that they expire very quickly, and so that's why you rarely see them out of a French Provincial market, so when I saw fresh, crisp ones at the local Hypermarket the other day, I nearly upturned the nearest veggie crate and started singing "La Marseillaise" with my hand over my heart. But what to do with them when the traditional 5 o'clock hors d'ouvres are off the menu? Salad. And I gave them a regional stamp. combine dressing ingredients. If you can't find pomegranate molasses, use a tiny dribble of grenadine (the real stuff), or at a stretch, treacle. add to other ingredients, combine and serve. If you don't like carrots too hard, you could par-cook them ahead of time, but remember the radishes have a nice crunch, so it's best to keep them fairly firm. 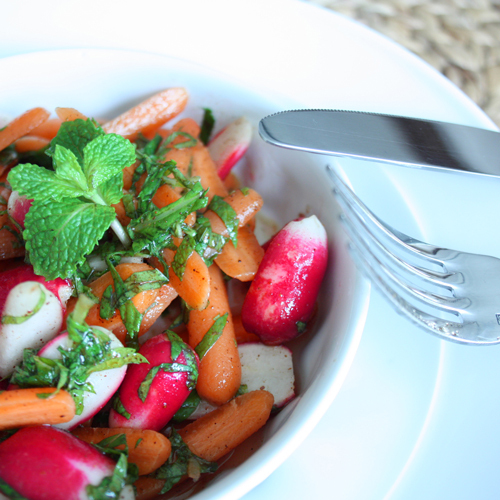 If you can't get these pretty little rosebud radishes, you could easily make the recipe with normal radishes. For presentation sake, however, I would slice them into thin rounds, and do likewise with large carrots.